PET bottle oil packing equipment can be used for fixed amount small package filling, straight line type filling, metical, electric, apparatus control of all sorts of viscous and no viscous, erosive liquid, such as plant oil chemical, liquid, daily chemical industry. It is rather simple and rapid to change items, the design is quite distinct, the property is very advantageous, its appearance corresponds to international concept for mechanical equipment. King Machine is a Manufacturer and Supplier in China,and specialized in providing you with PET bottle oil packing machines,oil filling machine,viscous liquid filling machine and so on. 1. 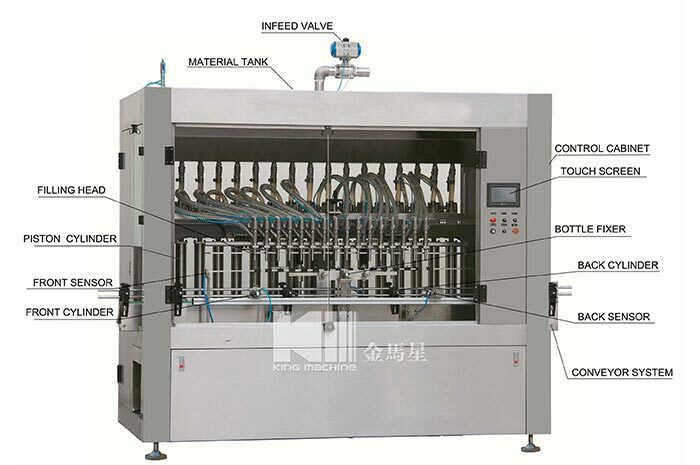 The series PET bottle oil packing machines, its design compact and reasonable, the appearance artistic and scholar. 2. Volume and quality of two kinds of metering free conversion, overcome the oil temperature of lower density grows still filling volume loss. 3. The unique design of filling head and back into the vacuum system, to ensure that the scene and packaging the finished product from residual liquid pollution, after the first fast slow two-speed filling volume can be set at random, filling speed is adjustable, solve the overflow bottle of quick filling pump pressure phenomenon. 4. Using dynamic filling without equipped with high pot, simplifies the installation process, reduce the production cost, improve the efficiency of the filling. 6. The native filling of high precision, stable performance, operation and adjustment easy work, quality of excellence. 7. Choosing the international brand of electrical components. The main powered cylinder, chose the Taiwan Airtac double-action cylinder and magnetic switch, the Japanese Mitsubishi PLC computer, photo electricity and Taiwan-manufactured touching screen, ensuring a good quality and lasting steady performance. 8. The PET bottle oil packing equipment has a convenient maintenance, needn’t any tools, may easily dismantle, clean and fix adjustment convenient. The measurement’s adjustment, may at first large range adjust to approaching measurement, then micro adjust. Make not to fill when there is not bottle or lack of bottle, ensuring the accurate measurement. 9. May determine the filling-head number and the cylinder volume per the user’s production demand. The 4-heads,6-head, 8-head and 10-head mat be chosen, the cylinder volume has 25-250ml, 50-500ml, 100-1000ml and 250-2500ml. 100ml-5000ml ,The whole edible oil filling equipment has speed-adjustable bottle-conveying tape, high strength stainless steel framework, firm and durable.